The American free enterprise (capitalist) system is a wonder of wonders. Just how do we ensure that all of our citizens needs are provided for? How do we make sure that we produce what we need and that those goods are allocated fairly (distribution). Of course I am referring to the three basic economic questions. So, just how do we ensure they are being answered properly. Well, the reality is, we don't! In America, and in all basically capitalist systems we rely on a rather complex theoretical model to tell us this whole free enterprise thing works. This model is called the Circular Flow Model. What the circular flow model tells us is that three basic elements of the econmy will work and interact together to ensure that our needs and wants are provided for. As you can see, each sector of the economy feeds another. Households (consumers) provide businesses with payments in exchange for jobs and goods and services. Government provides consumers and businesses with payments in exchange for goods and services from business and taxes and resources from consumers. It is what is called a symbiotic relationship. We all rely upon one another. Is the circular flow model complete? No, nor is it meant to be. It is merely a theory that explains how free enterprise works. Banks for example, a very important part of the economy, are left out. 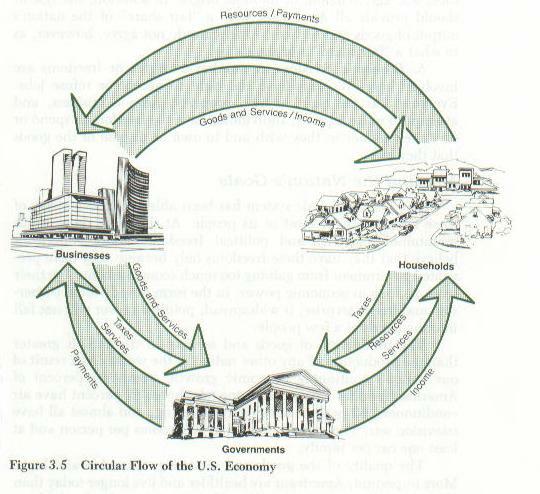 Some socities do not accept the circular flow model theory. These socities, therefore, choose another economic system other than capitalism. Socialists and communists see the role of the government in a different light than capitalists do. They see a government that must in some cases should provide for all needs (command) and in other cases provide for some needs (socialist). They do not trust that this will all just work out the way the theory says it will. Does circular flow work? The answer is yes and no. Yes, in that we are a wealthy, productive society. No, in that there are some citizens who fall through the cracks and do not have their needs met. We try to help them and thus move closer to socialism and increase the role of government. This is why we are really a mixed economy and not a pure capitalist economy.